Tantabiddi boat ramp is very popular with the recreation boating fraternity, the whale shark operators, government agencies who use the ramp for coastal compliance related issues, research vessels and locals. The existing boat ramp was a single lane structure that had been impacted by extreme coastal processes associated with cyclonic conditions. A new boat ramp was constructed on the northern side of the existing boat ramp. 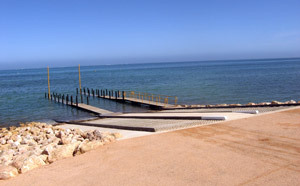 The new boat ramp extends a further 10 metres to sea and now has a corrected elevation. There is now a mooring walk way at the facility on the northern side. The existing boat ramp was reconstructed to meet the new specifications and the project in its entirety was completed on time ready for the world renowned Gamex Fishing Competition and International Billfish Tournament 2012. The new boat ramp has created a boost to recreational and commercial activities on the western side of the gulf. The next project currently underway is the redevelopment of the toilet and fish cleaning facilities at Tantabiddi which is scheduled to be completed in 2013.